Police, scientists and aviation officials don't know the source of the sound. A mysterious booming sound was heard by people across the Gardiner and Augusta areas around 9 p.m. Sunday night, but the source of that rumble remained a mystery late Monday — and lacking a clear explanation, theories about the noise swirled on the social media feeds of central Maine residents. Could warm, wet pockets of air have risen throughout Sunday, mixing with cool air and causing a single crack of thunder at night? Did a propane truck explode after striking a utility pole, as some rumors had it? How about the electrical problem at a Central Maine Power Co. substation in Augusta around 10 p.m. Sunday, and the resulting loss of power to 3,677 customers in Sidney and Augusta? Could they have been related? Earthquakes, meteors, fighter jets and North Korean missiles were among the other explanations offered on Facebook — with mixed levels of seriousness — after the booming sound was heard around lower Kennebec County. Area police departments did not know what caused the rumbling noise but received dozens of calls about it, said Steve McCausland, spokesman for the Maine Department of Public Safety. The bulk of the calls came from the Gardiner and Farmingdale areas, McCausland said, but some reports came from towns like Winthrop and Manchester. A few residents even said the ground was shaking. Firefighters were also busy Sunday night. In Augusta, they were responding to minor issues related to the CMP power outage at 10 p.m. — fire alarms going off, smoke filling a business on Stephen King Drive. In Richmond, firefighters helped put out a car fire on Toothaker Road around 9:45 p.m. Most dramatic was the explosion of two, 1,000-gallon propane tanks further north in Pittsfield around 9:30 p.m. But none of those events explained the low rumble experienced by so many people in southern Kennebec County between 9 p.m. and 9:30 p.m., according to supervisors from those fire departments. 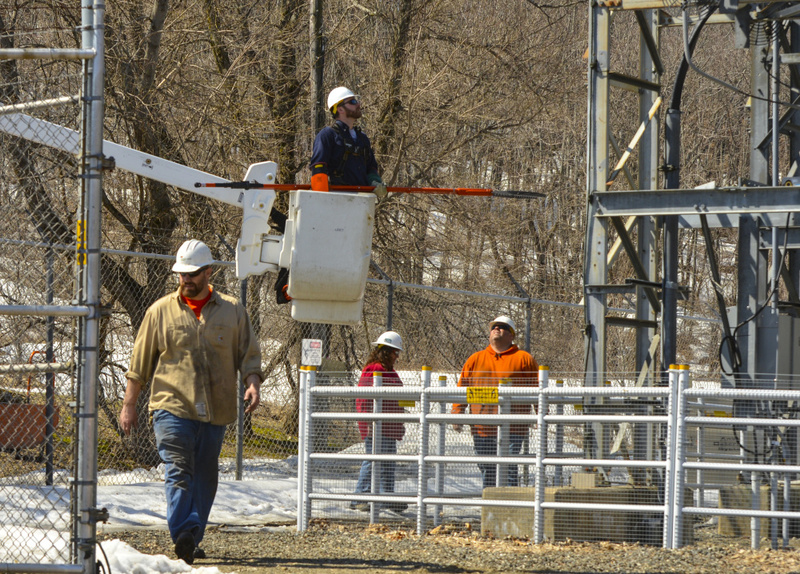 Rice, the CMP spokeswoman, said she didn’t think the substation on Mount Vernon Avenue created the booming sound that many people heard along the Kennebec River an hour earlier. A problem was reported at the substation around 10 p.m., Rice said, and workers cut the power so they could fix it. “It was just a coincidence,” Rice said. Some central Maine residents took to social media to search for explanations and express their wonderment. When Dan Burns of Augusta wrote on his Facebook page, “What blew up?” the question received more than 40 responses. “Sonic boom?” Burns wrote later, referring to the loud noise that’s produced when a jet flies faster than the speed of sound. A spokesman for the Federal Aviation Administration said in an email that the agency has not received “reports of any sonic booms” Sunday night, but he did not immediately respond to a request for more information. And neither the Maine Army National Guard nor the Maine Air National Guard have aircraft that can travel fast enough to create a sonic boom, said a spokesman. Scientists familiar with Maine’s natural elements were also skeptical about some of the explanations that have been offered for the loud sound. Some people have suggested it could have been an ice quake, also known as a cryoseism, in which rainwater gets into the dry ground and rapidly freezes, creating earthquake like conditions. But no rain fell on Sunday, and the weather was not cold enough at night for such a phenomenon, said Pohl, the meteorologist from the National Weather Service. “We have no idea what it could have been.” Pohl said. Earthquakes are not out of the question in Maine. The North American Plate is always shifting, and the Pine Tree State generally registers between 10 and 12 minor earthquakes a year, said Bob Marvinney, the state geologist. But after looking at seismic data collected in central Maine over the previous couple days, Marvinney said he couldn’t detect any record of an earthquake having occurred. The reports of a booming sound Sunday night did remind Marvinney of a similar episode that occurred in Massachusetts years ago, defying all explanation.